theme using the Alice Cocktail. Ready to shout it to the world, I chose the Ultimate Wedding Magazine to launch the Alice Cocktail! And I’m so proud to introduce it here on Alice In Weddingland! I created the Alice Cocktail to help Brides design their wedding using a theme in three easy peesy steps. It’s just like making a cocktail; you choose the three ingredients, shake it all up, and pour! After hearing from so many Brides asking ‘How do I know how far to take my wedding theme idea without it turning into a mess and I was compelled to give them the easiest route to doing it. I’ve seen a myriad of themed weddings and some of them were OTT and they lost their idea amongst too much detail. It’s like art and fashion; there are boundaries to what looks good and what doesn’t. If we throw everything in, nothing stands out. I’m going to show you how simple it is to make your wedding personal, younique and spectacular using a theme for your wedding but without going OTT. And it’s sooooooo easy! In fact, it’s kind of like making a cocktail so if you find that easy, you’ll love this! Having a wedding theme not only makes planning your wedding easier, it creates a story; an intimate adventure that you and your guests share on your big day, and it makes your wedding uniquely personal which, makes it memorable. What is a wedding theme? A wedding theme is simply a style that you use to create your big day. It creates a statement of who you are, what you love; your story. You incorporate your chosen wedding theme by reflecting it in your invitations, your dress, your decor, your music, anywhere and everywhere! But be warned… it’s pretty easy to churn out what everyone else has done before you because there is so much inspiration out there from wedding blogs, magazines to friends and colleagues. And all this consumption of information can quickly become overwhelming, costly and drive you bonkers well before the big event. So how can you plan your wedding using a wedding theme to create your perfect wedding; your spectacular day that resonates personality, is intimate, younique and memorable, easily? I’m going to show you in 3 easy steps? Yep, just 3. And it will take you no time at all to do. In fact, grab a cuppa, that’s probably all the time it will take. Before we start, there is one really, really important thing to do. That is, you MUST think outside the box! Why? Because otherwise your wedding will lack personality, youniqueness and you simply end up regurgitating what has already been done many times over. Identify three elements of your theme that you love. ONLY three. For e.g. I love Steampunk but I really don’t like those weddings that have everything done in Steampunk as it is overpowering and you lose the sophistication and romance of what a wedding is, but that’s just me. So I would pull out those elements of Steampunk wedding theme that I am attracted to, remember, only 3: 1. Corsets (my ultimate must have), 2. Colours (rusts, golds, royal reds, browns) and 3. Accessories (pocket watches, antique jewellery, Steampunk goggles etc.). By considering the top three elements, I now have a great start to designing my wedding theme; I know what to look for by using these three elements. Can you see what’s happening? We’re beginning to create a visual story that reflects who you are, what you love and shapes the fairytale that you and your guests will experience. Your list is personal! Keep it and treat it as the most important part of your wedding planning. And although the list is flexible; If you find along the way that one or more of the elements on the list aren’t quite right, simply change them. However, the most important thing you need to remember is to stick to this list. DO NOT add any more! The most stunning example of theming a wedding that I have seen just happens to be a Steampunk wedding that I featured on my wedding blog, Alice In Weddingland, last year. It was a huge hit. The couple loved Steampunk however to create a sophisticated yet fun version of the wedding theme they had to ensure they didn’t over do it. This is the risk when you use a theme to design your wedding. This particular couple used the elements that they loved (colours, mechanics, corsets) and injected their personality and created what I personally consider to be a benchmark to creating a spectacularly themed wedding. It was absolutely stunning – every little detail. It was an elegant, sophisticated and fun wedding. If you’d like to see their wedding theme, do check it out here on the blog http://www.aliceinweddingland.co.uk/a-unique-steampunk-wedding/ where you can see loads of photos and details of their wedding using the Steampunk theme. You can recreate the kind of spectacular no matter what theme you’ve chosen be it ‘white’, retro, a Jamboree or even Alice In Wonderland. Simply follow the 3 steps. 1. Choose your three (ONLY three) ingredients that you love about the theme. 3. Mix it up – Voila! Happy planning! And do send me a pic after the big day, I love themed weddings! 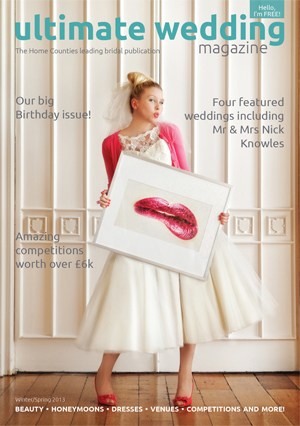 To view my article and more brilliant wedding inspiration, read the wedding magazine online now. Steampunk wedding theme – this blows it out of the park. Taking Kirsty’s three ingredients she designed one of the most stylish, fun yet still sophisticated Steampunk weddings I’ve seen. Great Expectations (vintage/retro) – a photo shoot showing just how contemporary wedding dresses and the finer details can work to creating a spectacular wedding theme. And to help inspire you do check out my article on How to style your wedding using fashion as your influence as well as my post on What Really Defines a Unique Bride. I’m on the lookout at the mo for spectacular themed weddings so if you’ve seen one or are having one, Alice calls 🙂 I’d love to hear about it. P.S. What do you think of themed weddings? What defines the line between going overboard and keeping it stylish? What do you think of the Alice Cocktail? Featured image by the spectacular Aussie wedding photographer, Angie Peady. I am wanting to have a themed wedding with horse racing (well Royal Ascot to be specific) as this is where my fiancee proposed on the lawn on the pink bench, in front of everyone, so have kept the race card and would like to base it on this but dont want it to get tacky.